Whoopi Goldberg, a co-host of the T.V. 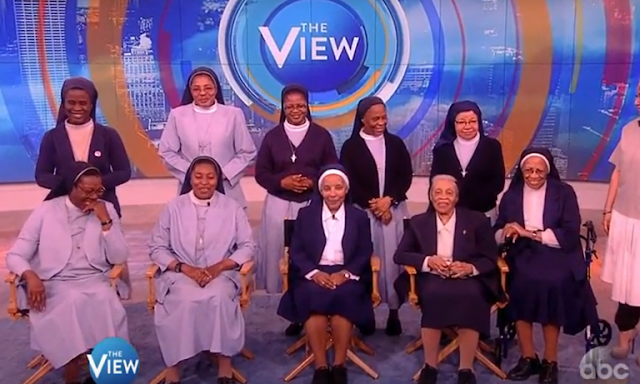 show “The View” and of “Sister Act” fame, surprised a group of Harlem nuns with a donation of a new van, a year’s worth gas and $10,000 to go towards their order’s charities. The order of the Franciscan Handmaids of the Most Pure Heart of Mary caught Goldberg’s attention as one of three traditionally black orders in the U.S. The Franciscan Handmaids serve in Harlem, New York City, and their apostolates include youth evangelization, education, palliative care, and a food pantry. “What do you do when people call you Whoopi?” asked View host, Raven Symone. “I smile, I laugh,” Sister Gertrude said. And then Goldberg, dressed in her own version of a Franciscan Handmaids habit, popped around the corner to surprise Sister Gertrude and her order with the money, donated by Retail Me Not, and the Sienna van donated by Toyota.